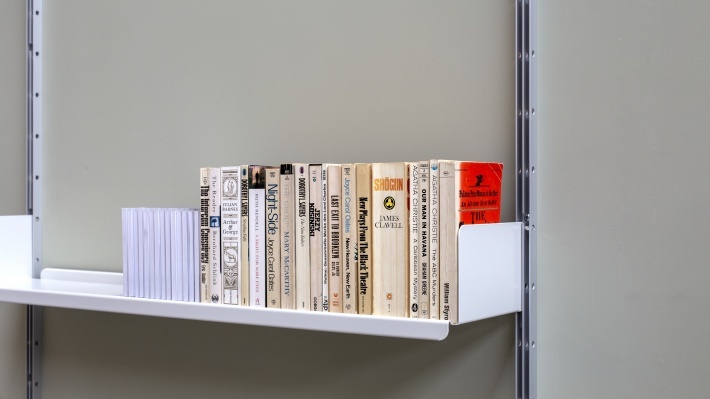 The usable depth of 16cm suits paperback books, CDs and Blu-ray. 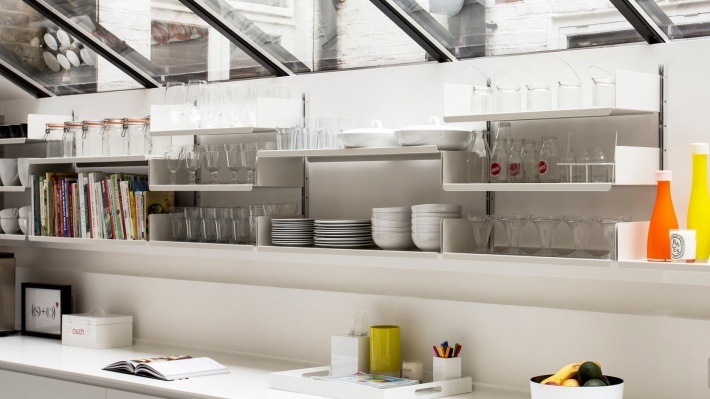 …and bowls, plates and more in the kitchen or dining area. 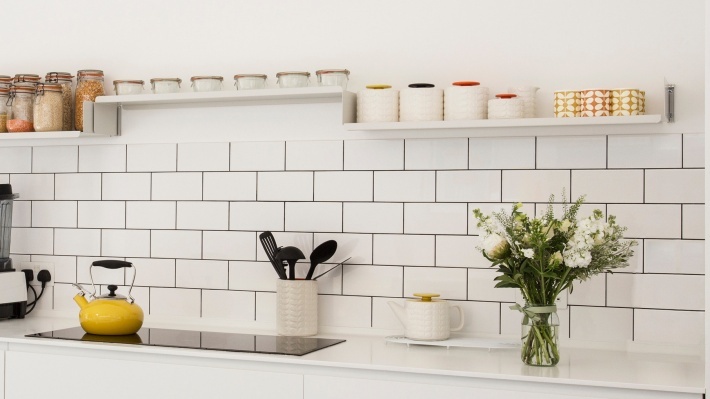 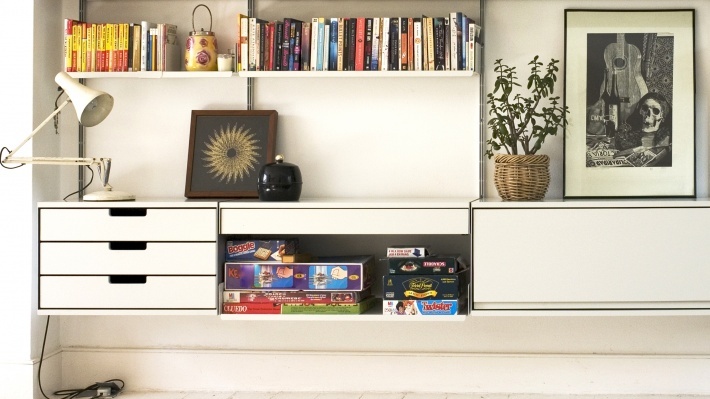 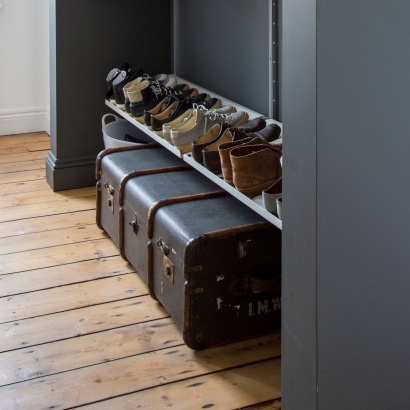 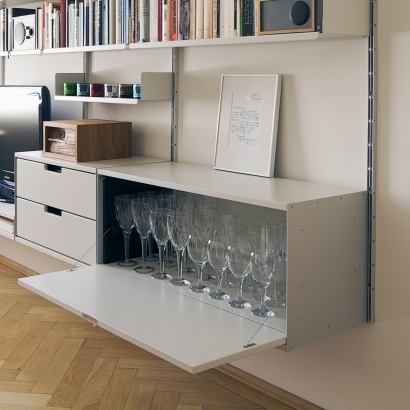 If in doubt, measure your items – you may be surprised what will fit on a 22cm-deep shelf. 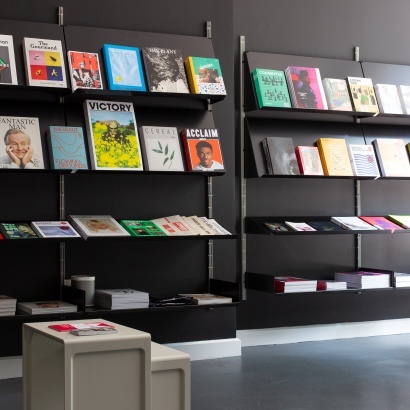 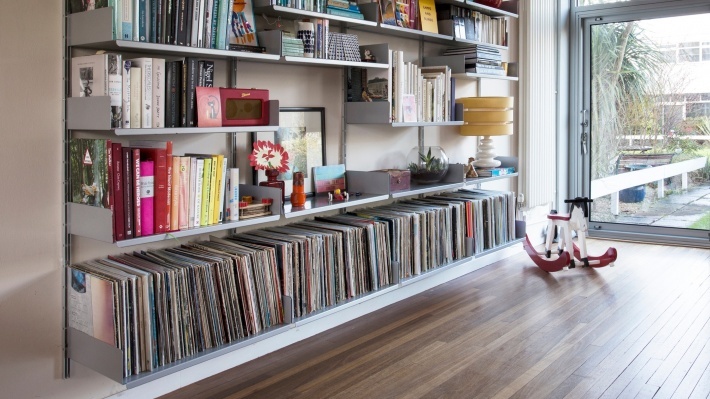 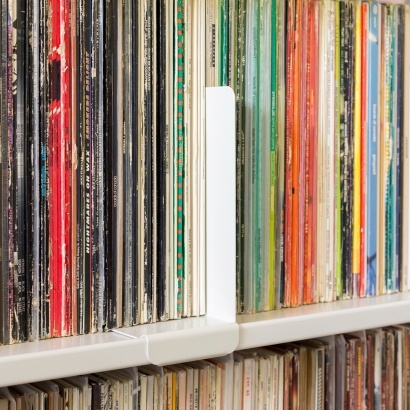 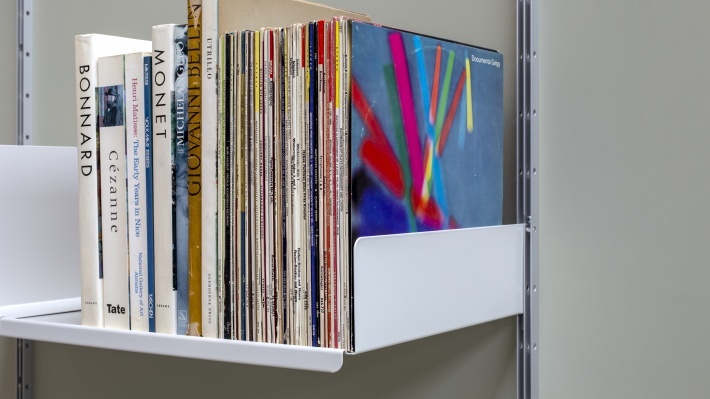 The deepest 36cm shelf is for your electrical devices, the largest hardback books – and 12” vinyl records (ideally on 65.5cm-wide shelves). 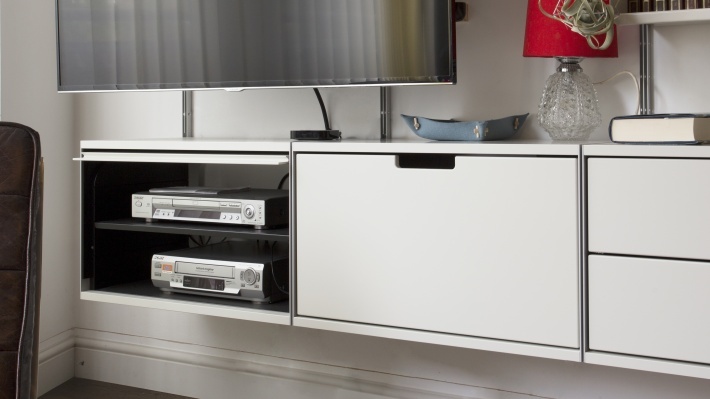 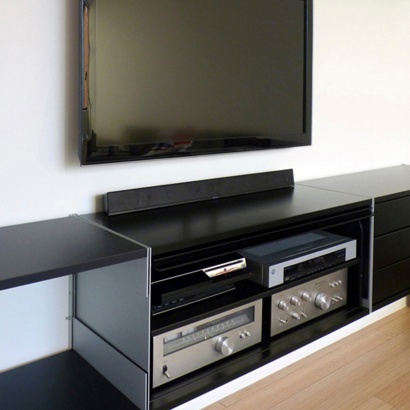 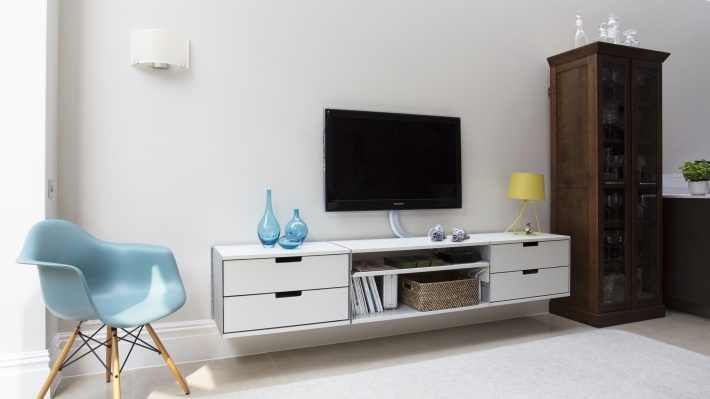 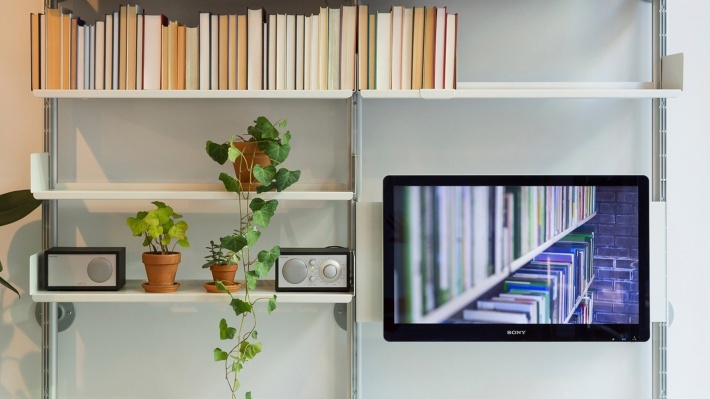 Used upside-down the 36cm-deep shelf creates a continuous surface for larger items such as your TV. 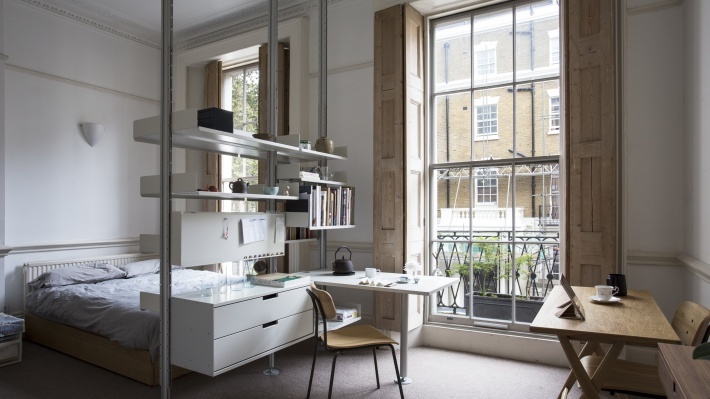 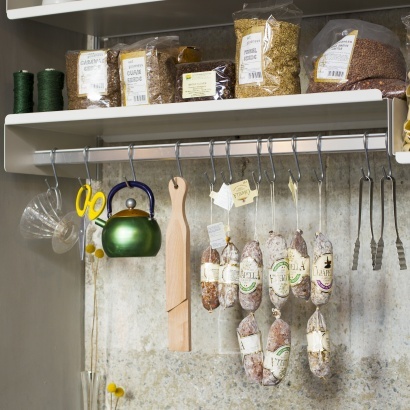 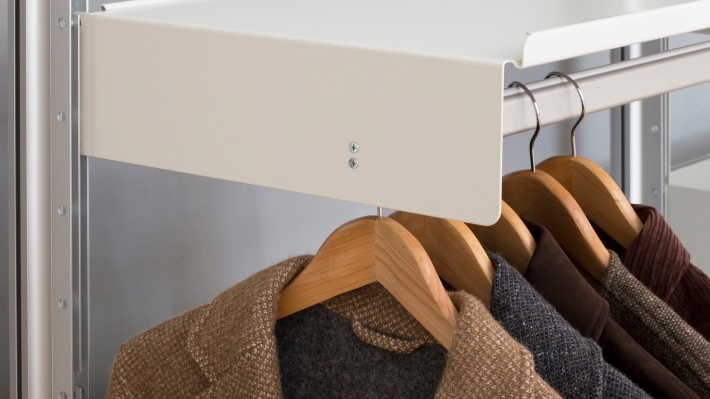 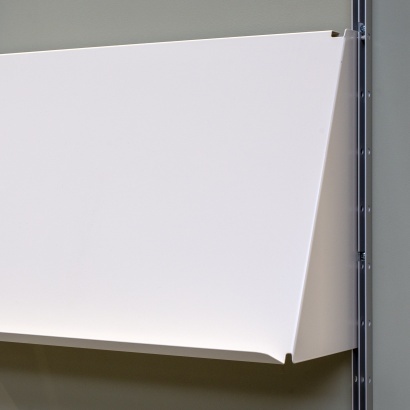 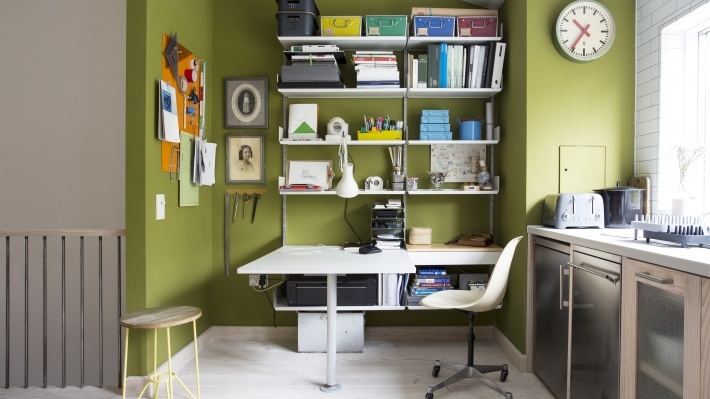 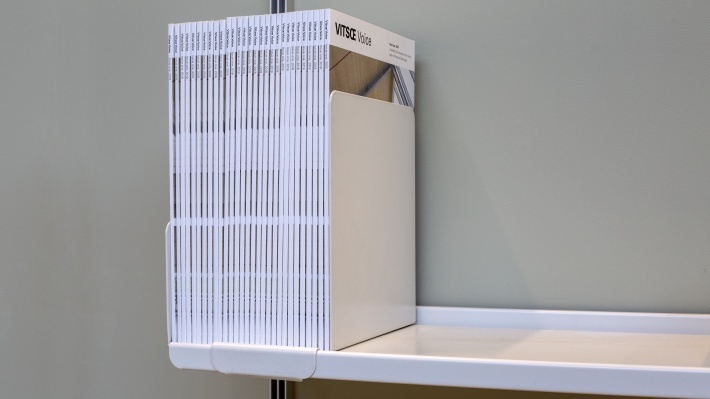 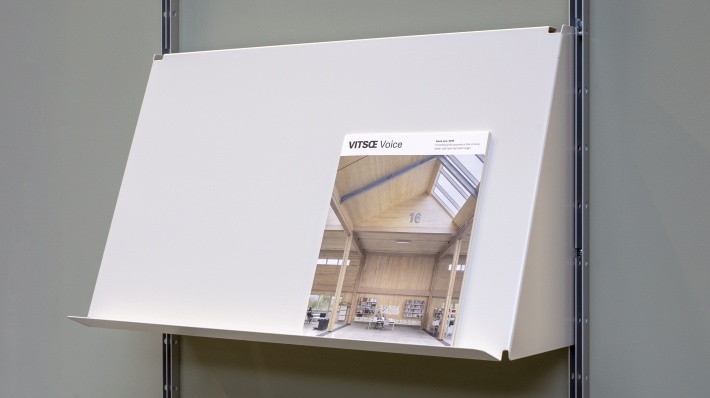 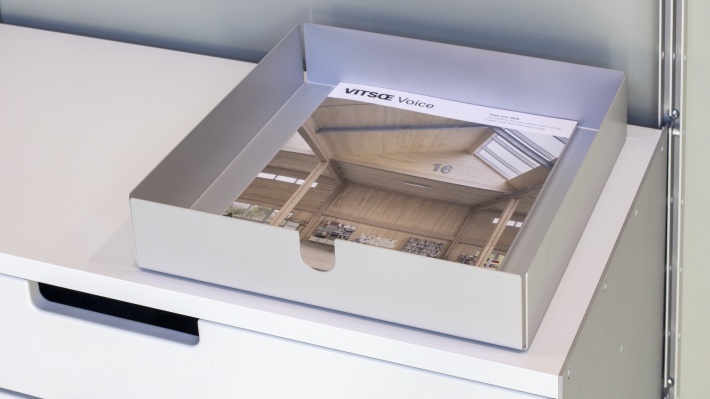 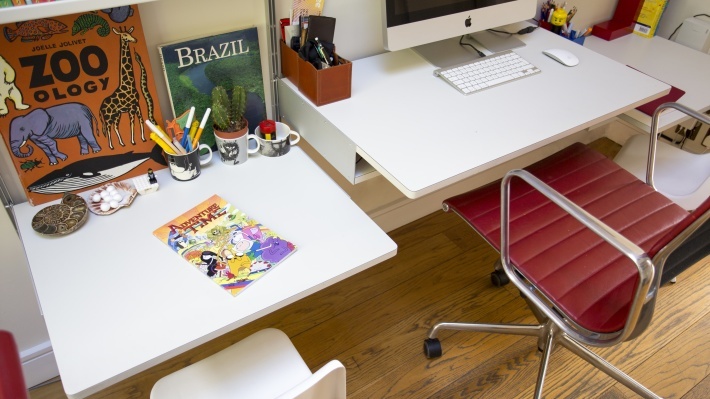 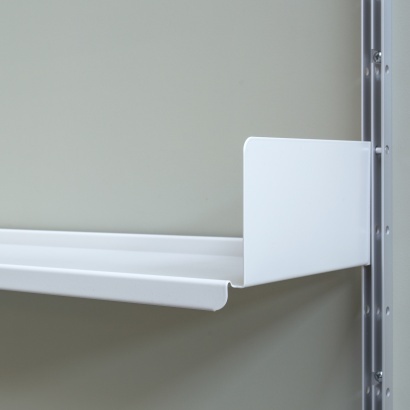 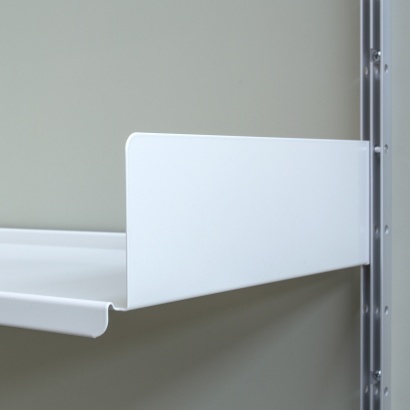 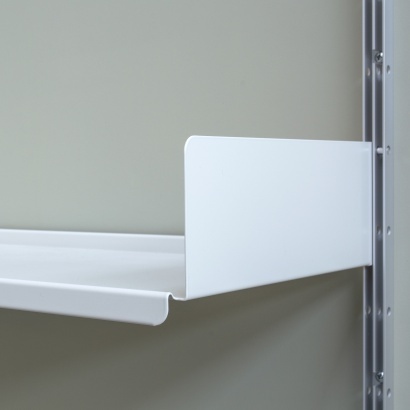 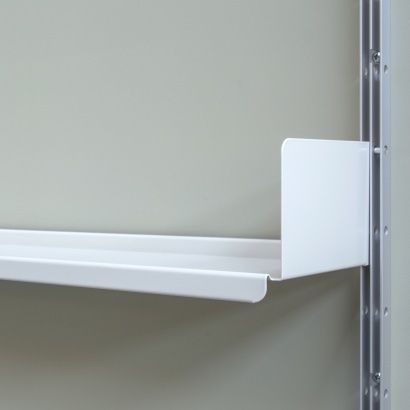 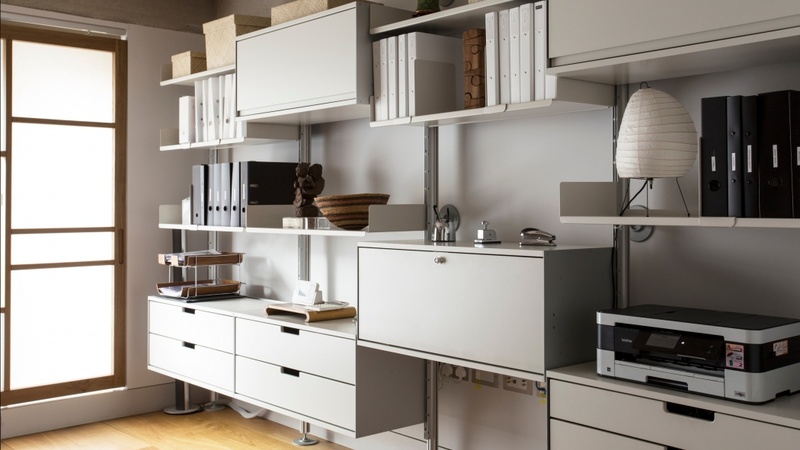 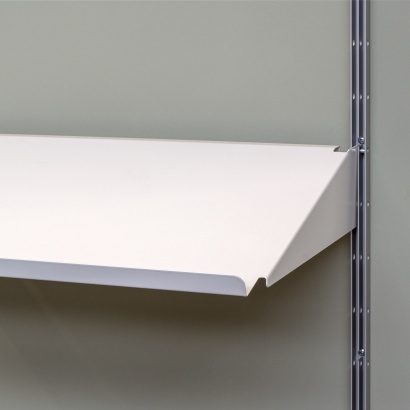 When rotated the shelf can be used as a magnetic pinboard – here above a desk shelf. 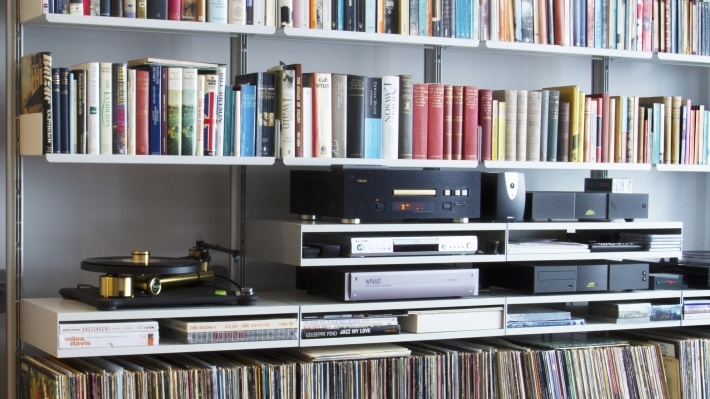 The low bookend fits on all depths of metal shelf. 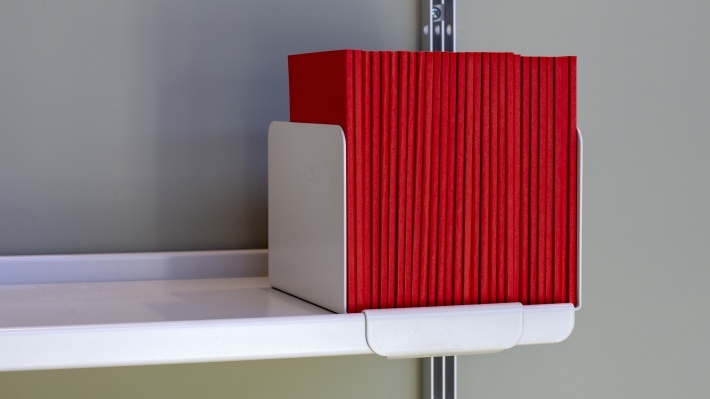 The high bookend is for 22cm, 30cm and 36cm depth shelves only. 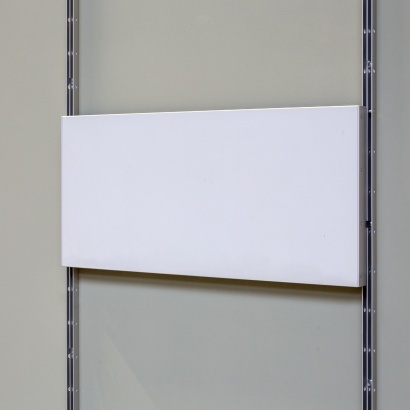 The left version forms a capital L when viewed from the front. 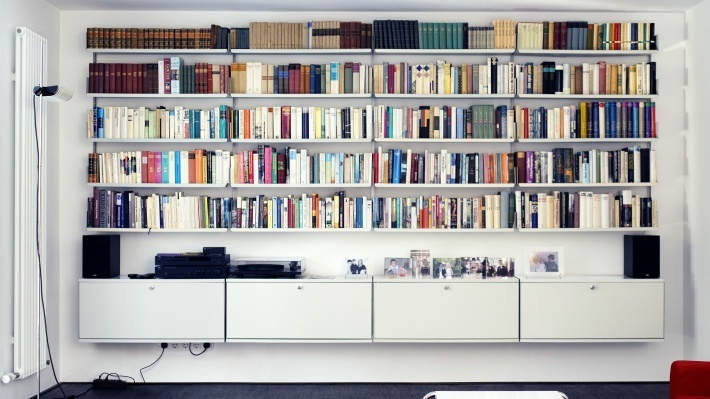 Tell us which you need. 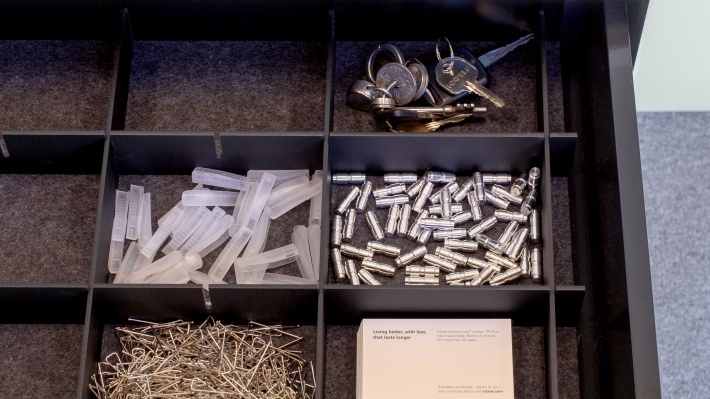 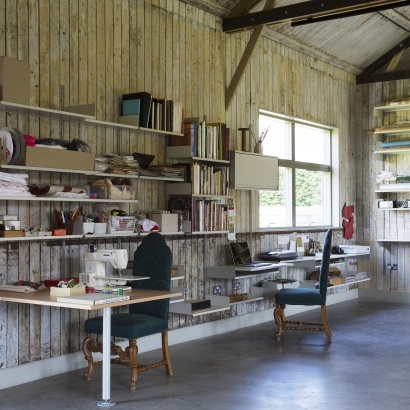 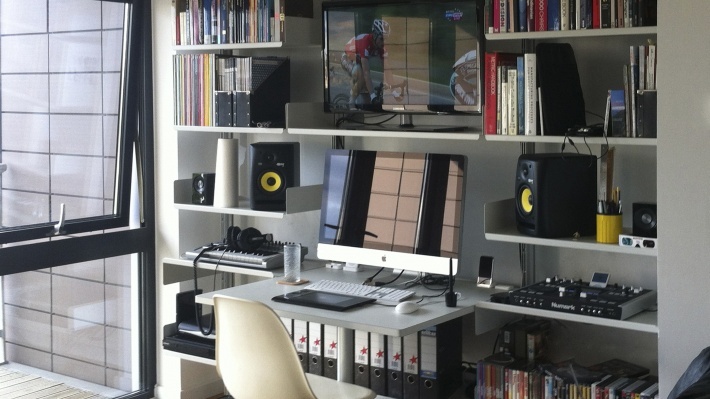 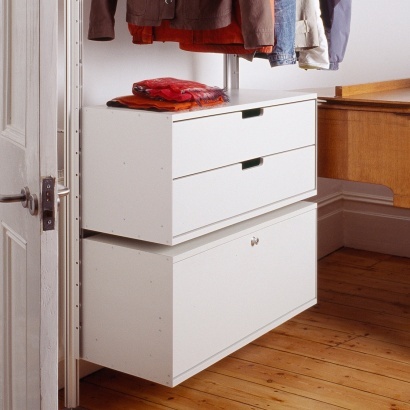 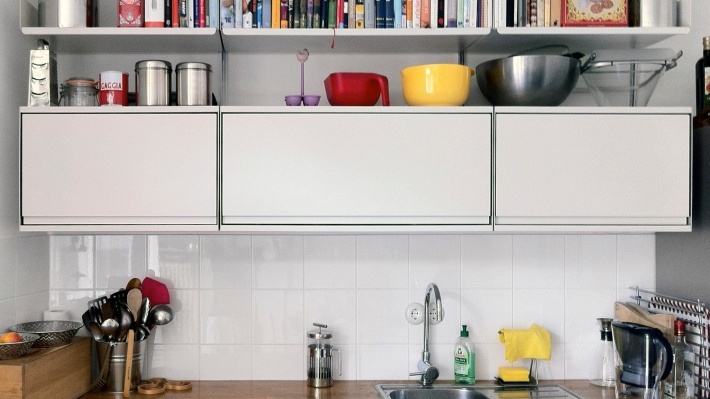 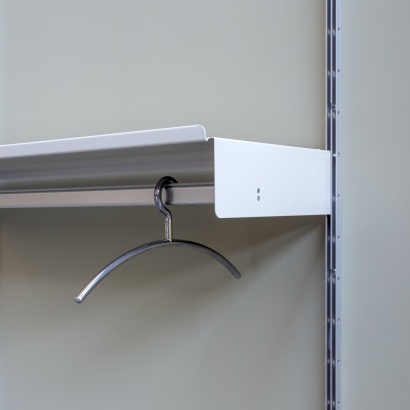 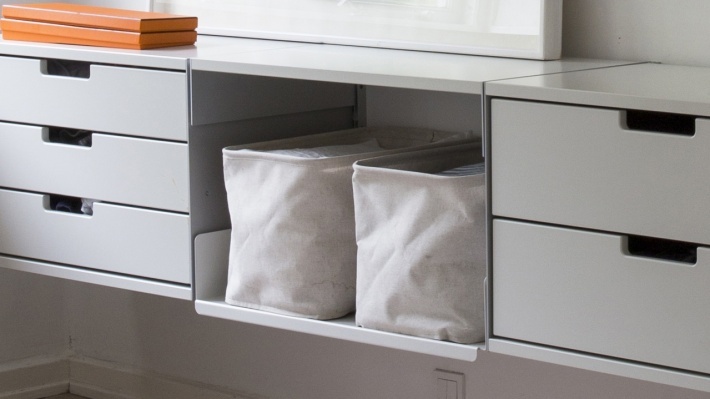 The cabinets – that hang from the E-Tracks – have drawers or doors to organise your life. 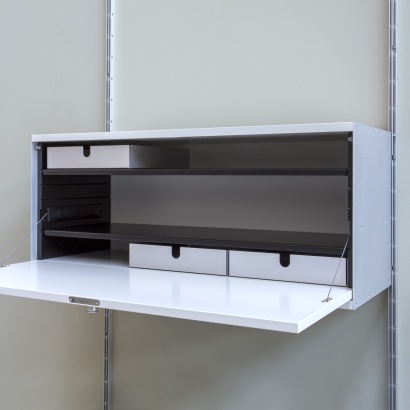 All cabinets are 36cm deep. 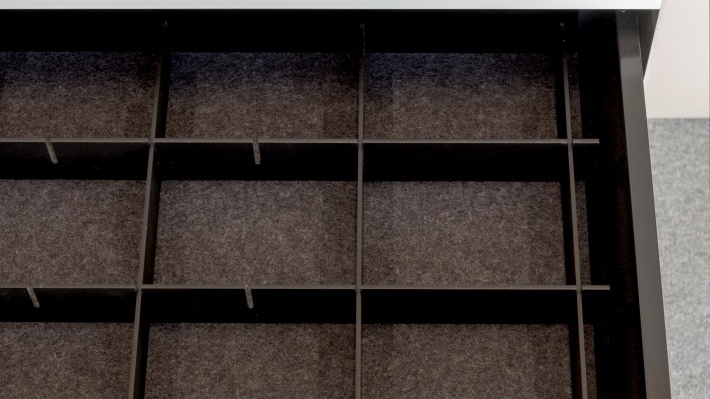 Internal dimensions can be found in the price list. 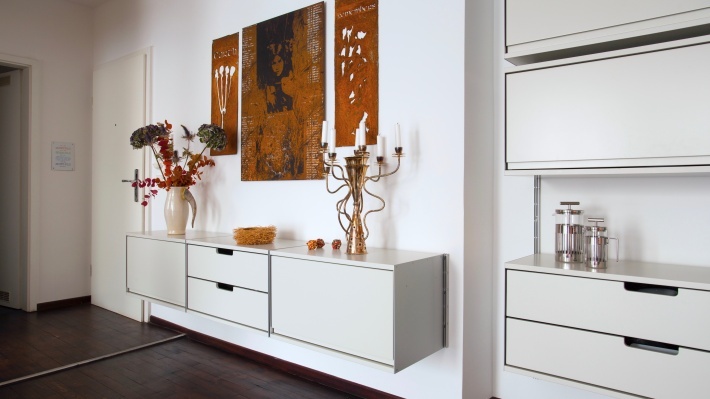 They are either painted with polyurethane lacquer or are beech-veneered. 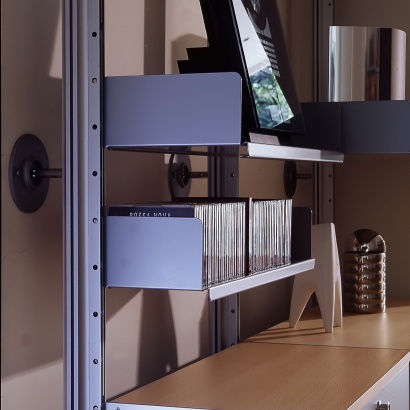 The end plates are 3mm anodised aluminium in a natural finish. 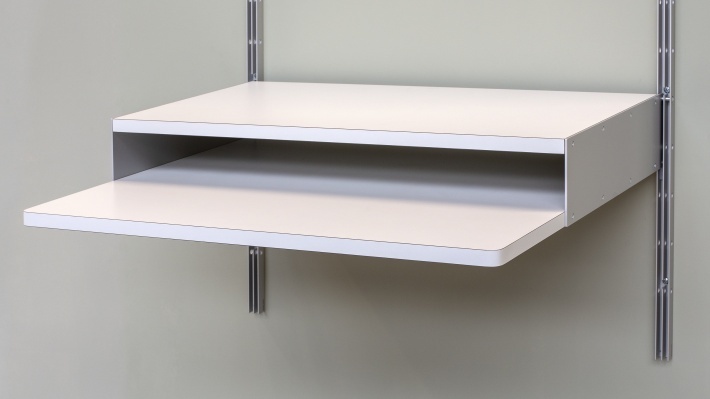 The integrated table comes in two depths – 80cm and 120cm – for eating or working. 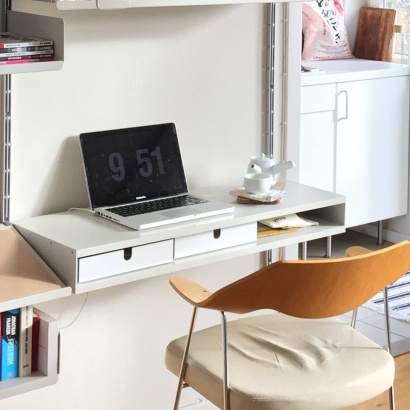 You can sit at all three sides. 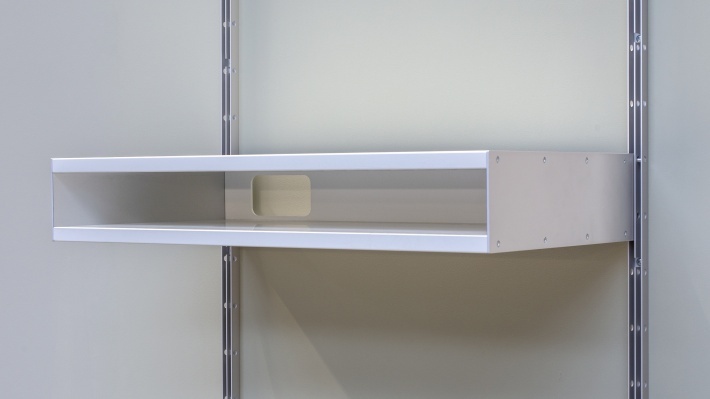 The height is 74cm. 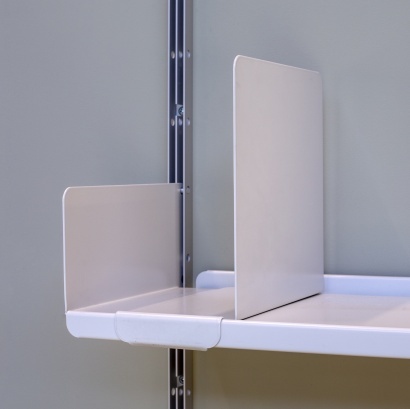 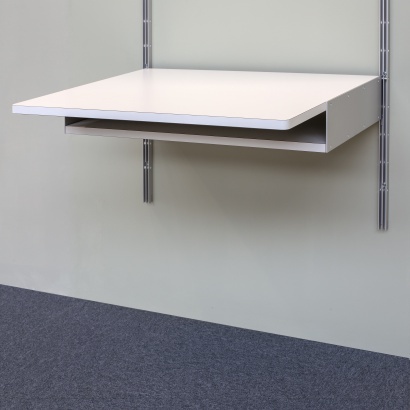 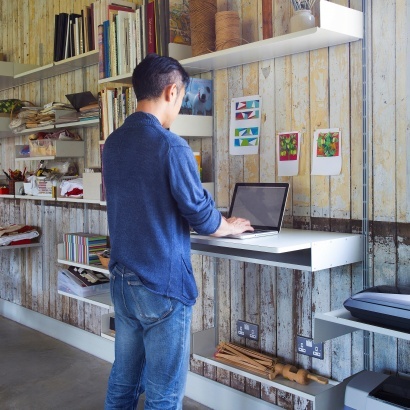 The desk shelf can be used at sitting and standing heights. 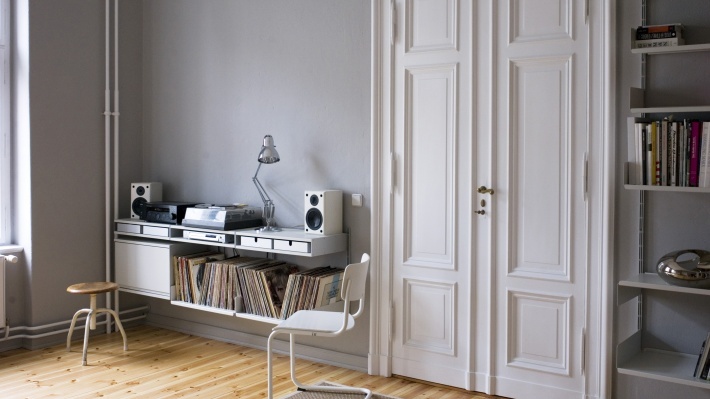 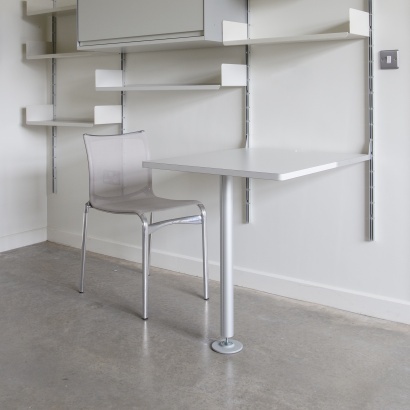 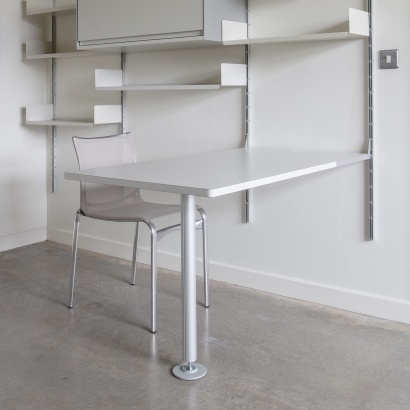 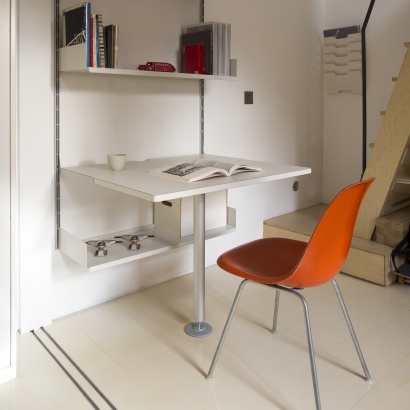 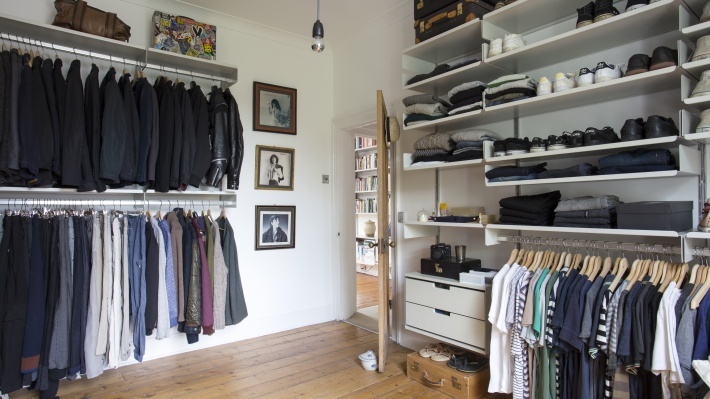 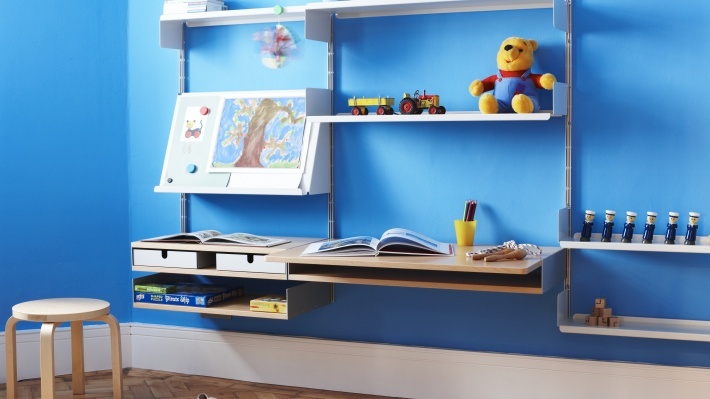 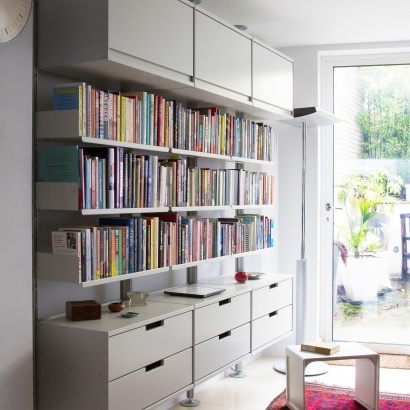 Shelves that provide a 36cm-deep surface at any height – for short or tall; for sitting or standing. 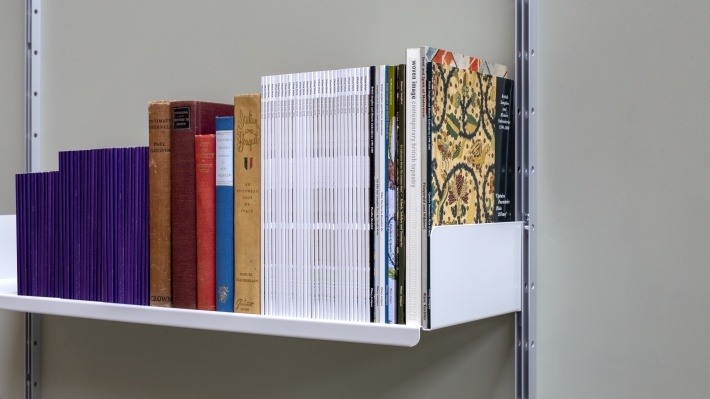 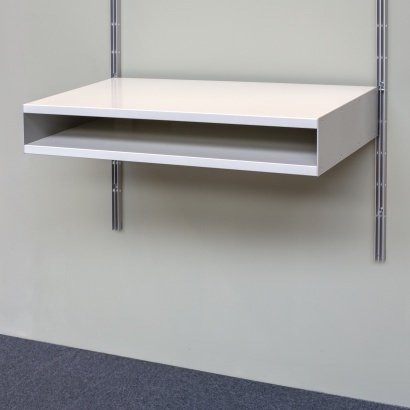 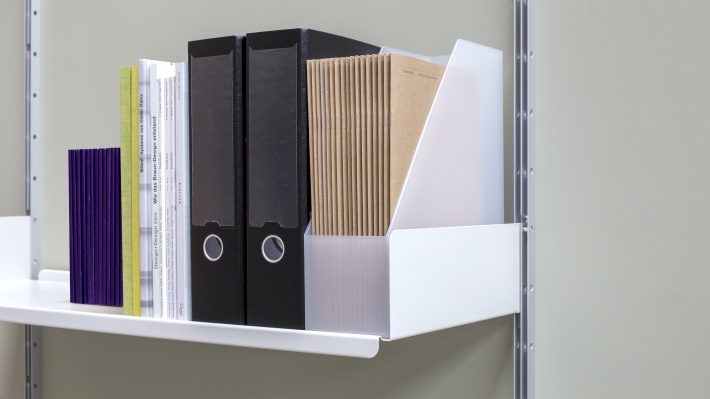 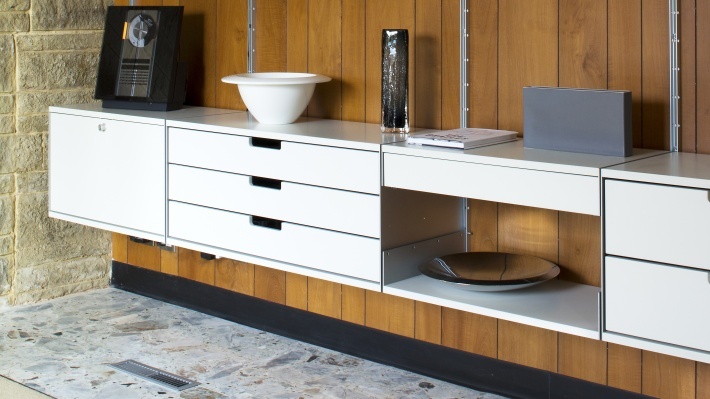 The lacquered or beech-veneered shelf with aluminium end-plates provides an alternative to the 36cm-deep metal shelf. 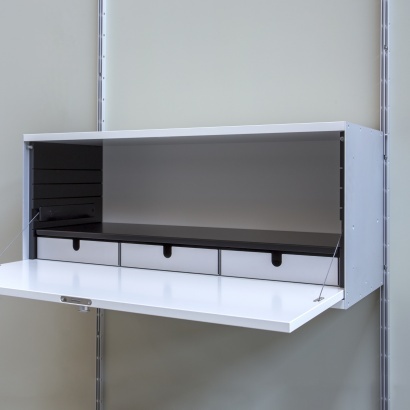 The double shelf can extend your work surface while looking after your aluminium trays (two per 65.5cm shelf; three per 90cm). 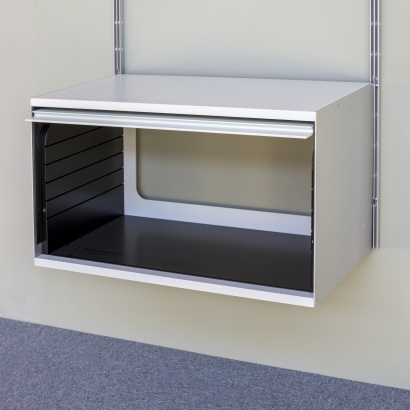 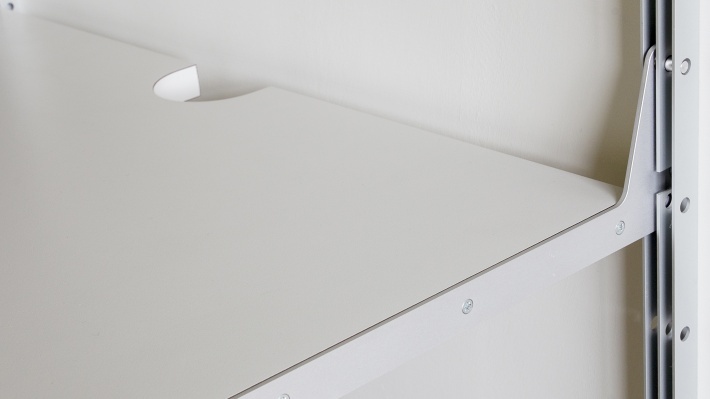 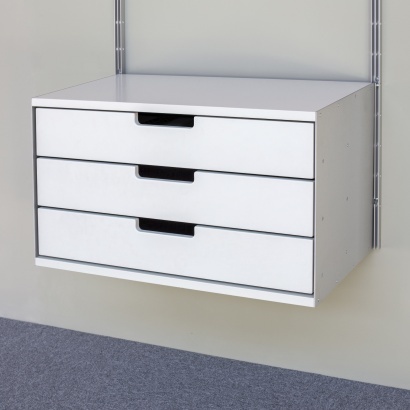 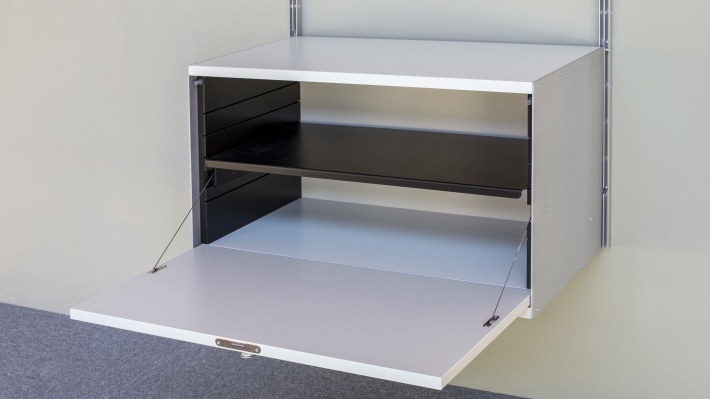 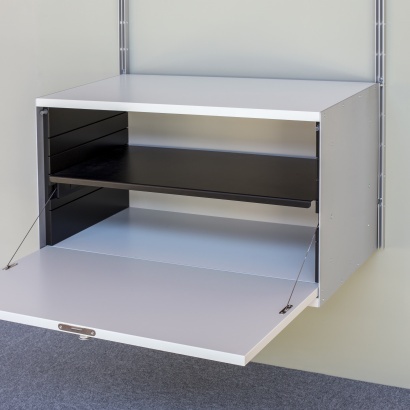 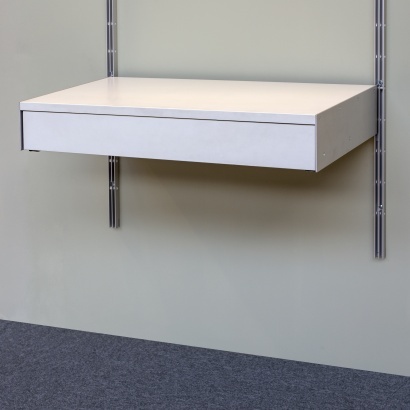 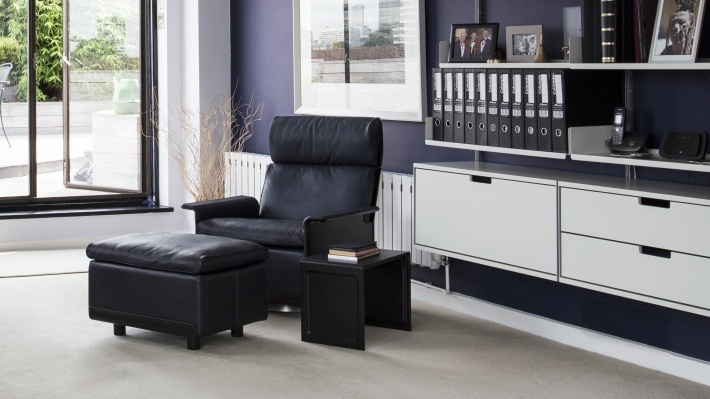 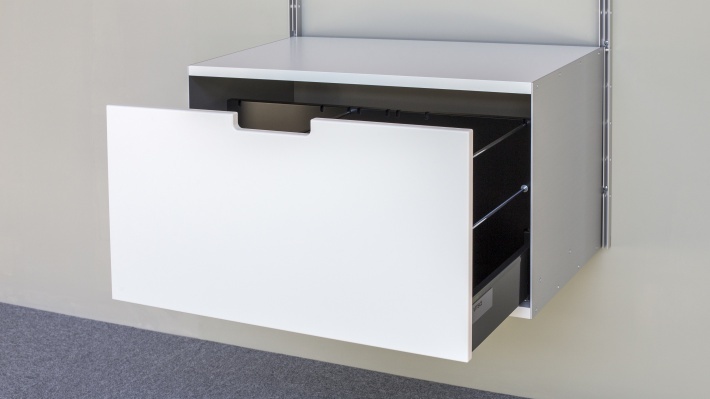 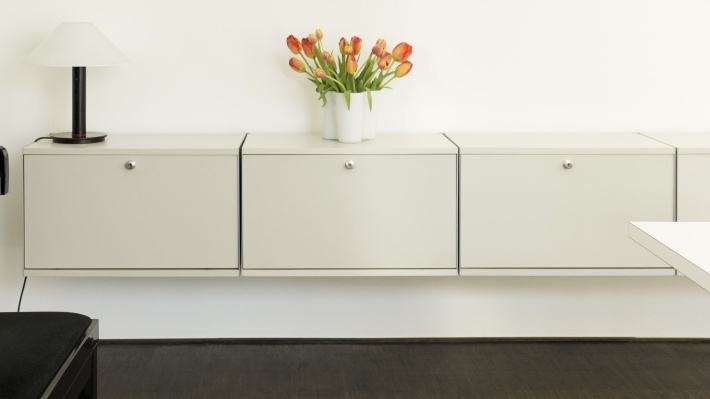 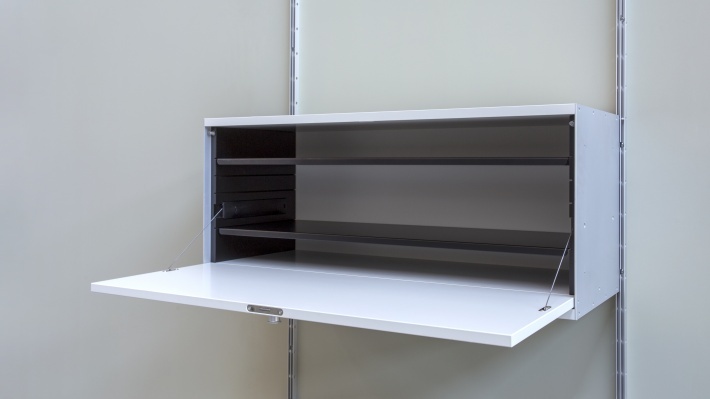 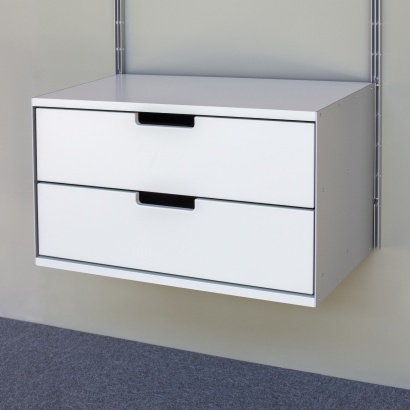 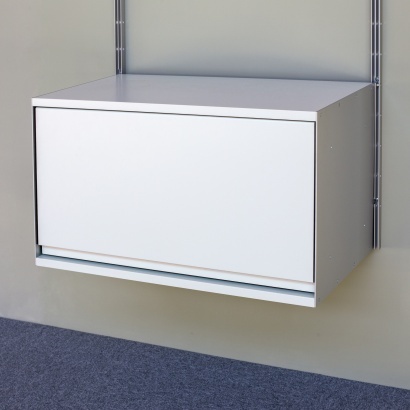 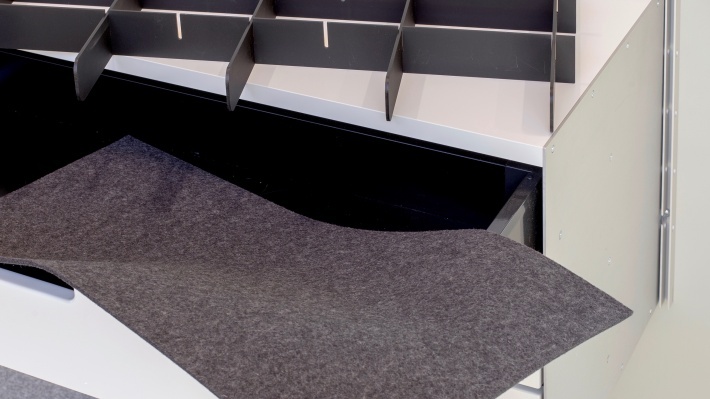 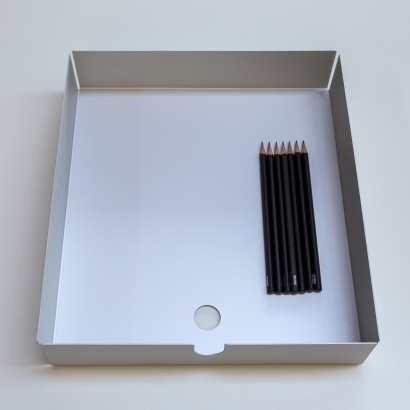 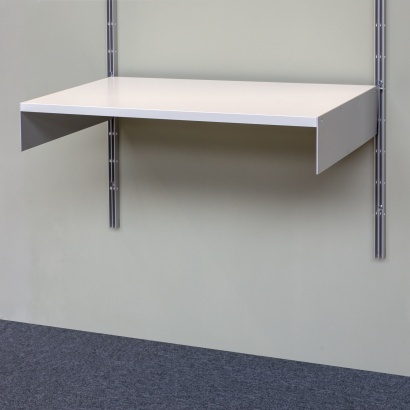 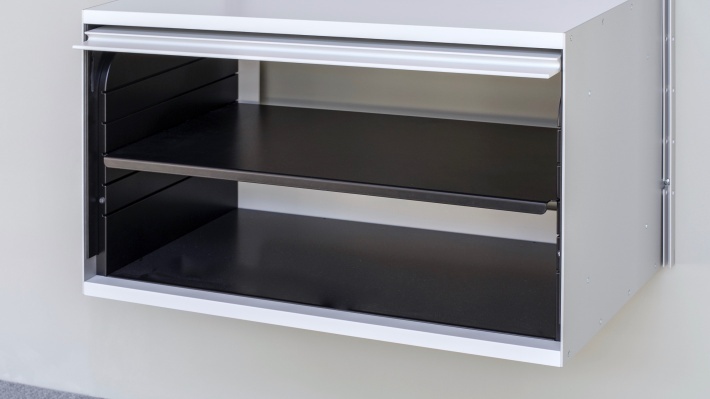 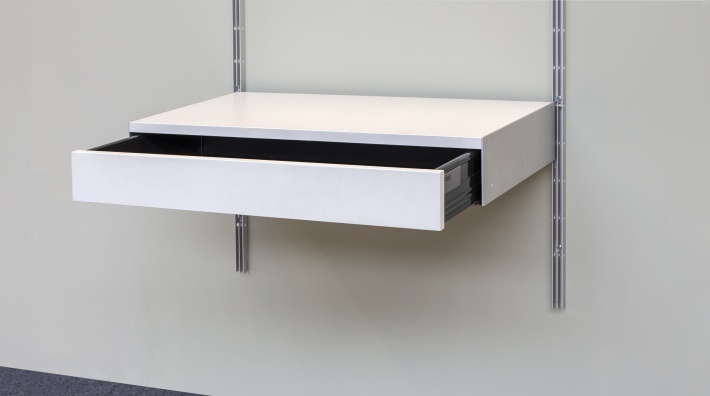 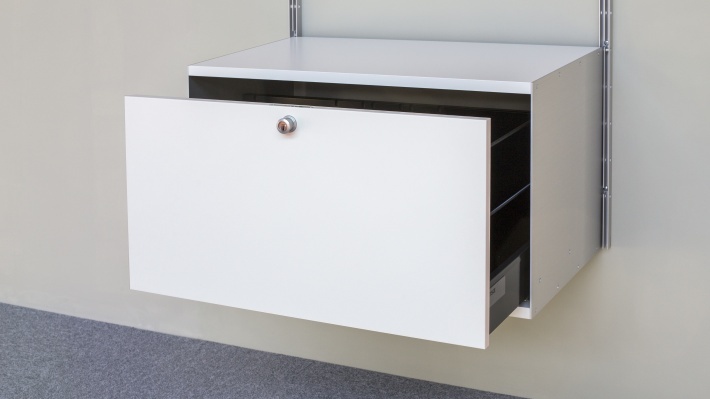 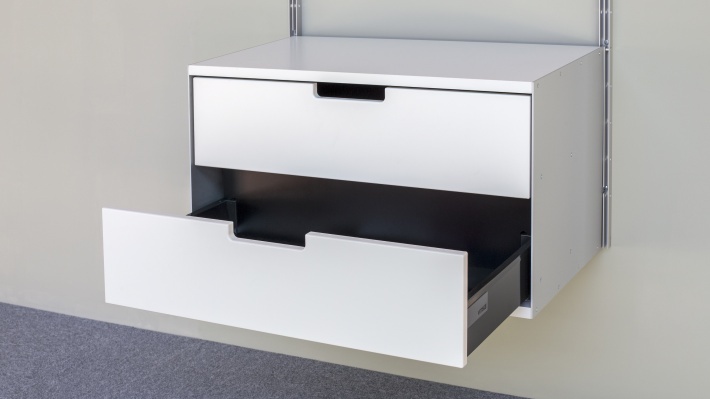 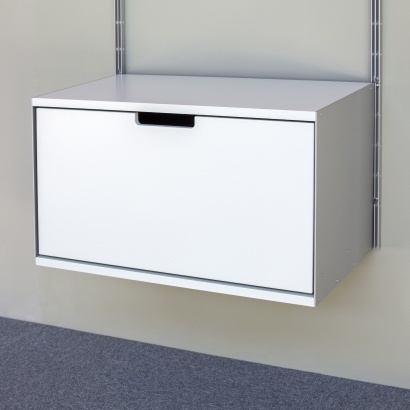 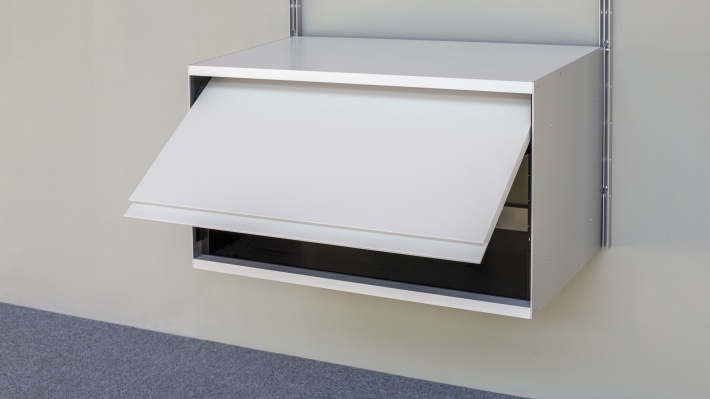 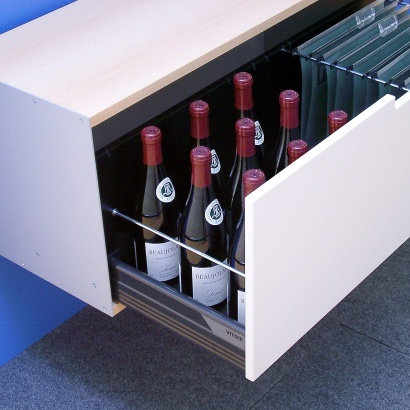 The aluminium tray fits in double shelves, desk shelves and cabinets with doors. 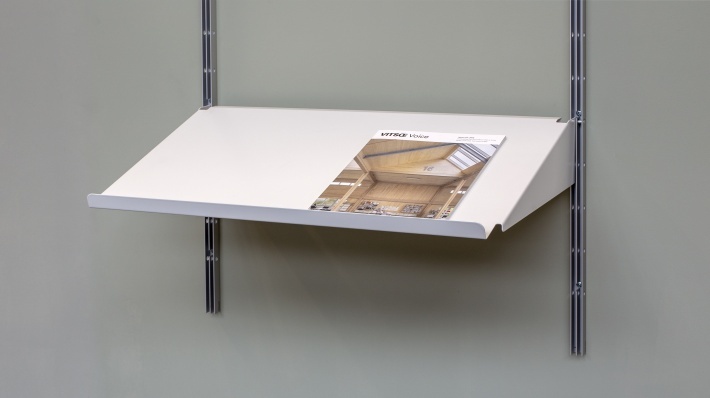 Or simply on a 36cm-deep shelf. 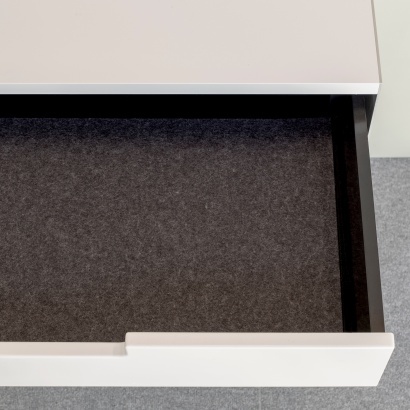 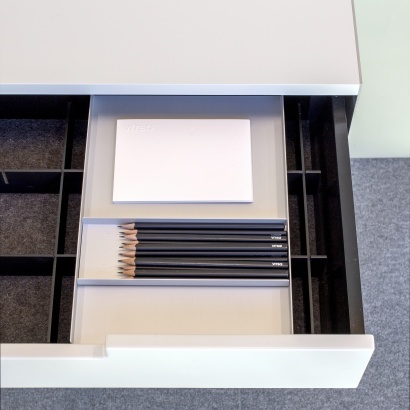 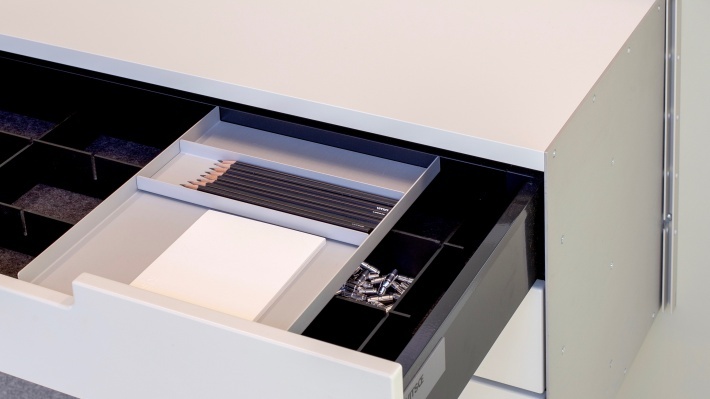 The adjustable drawer dividers organise your drawers. 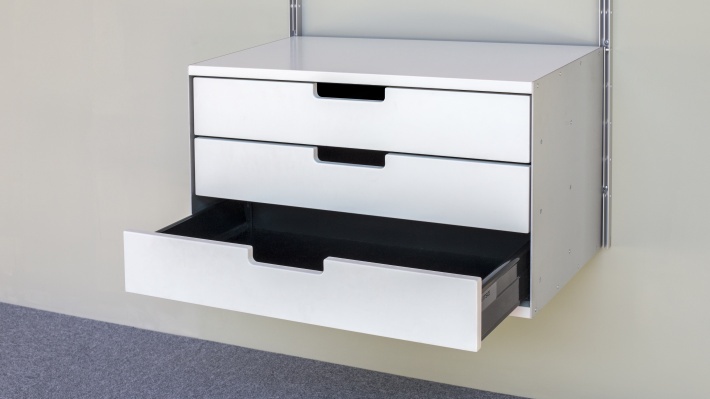 Good for organising your CDs in the two-drawer cabinet.